You can see much of the building from outside and it looks different from almost every angle! We’d also recommend taking one of the free guided tours to get a better look at the building from the inside. 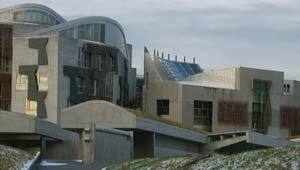 These tours take you to committee rooms, to the debating chamber and down shared corridors. You’ll also learn a bit about what the parliament actually does. The tours operate on non-sitting days and you can book in advance. If you can’t get on a tour, you can still see quite a bit of the inside like the Parliament souvenir shop, the cafe, the exhibition in the main hall and the public gallery in the debating chamber at all times when the parliament is open to the public. When inside, take a moment to look for saltire crosses (as used in the Scottish flag). You’ll find them etched into the ceilings, walls, the doors almost everywhere you look! When Parliament is sitting (usually Tuesday – Thursday) from 9am to 6.30pm. When Paliament is in recess (Mondays, Fridays & Parliamentary holidays) from 10am to 5.30pm in the summer and from 10am to 4pm in the winter. Also on Saturdays from 11am to 5.30pm. The parliament building is at the bottom of the Royal Mile next to Holyrood House and the Edinburgh Hop-on Hop-off Bus Tour stops outside.